Former CIA Director John Brennan in 2017. A group of top former officials who served under both Republican and Democratic administrations called the revocation of Brennan's security clearance "unprecedented." As NPR's Tamara Keith has reported, "Republicans have faulted Ohr ... for his contacts with the former MI6 intelligence officer who authored the infamous Russia dossier. Ohr's wife also worked for the political intelligence firm in Washington that commissioned the dossier, which was underwritten by money from Democrats." In the statement from ex-intelligence officials, former CIA Director William Webster and others call Trump's move on Brennan "unprecedented" and caution against using security clearances as a political tool. They describe Brennan as "an enormously talented, capable, and patriotic individual." The writers say they don't all agree with everything he has said, but, "Regardless, we all agree that the president's action regarding John Brennan and the threats of similar action against other former officials has nothing to do with who should and should not hold security clearances — and everything to do with an attempt to stifle free speech." 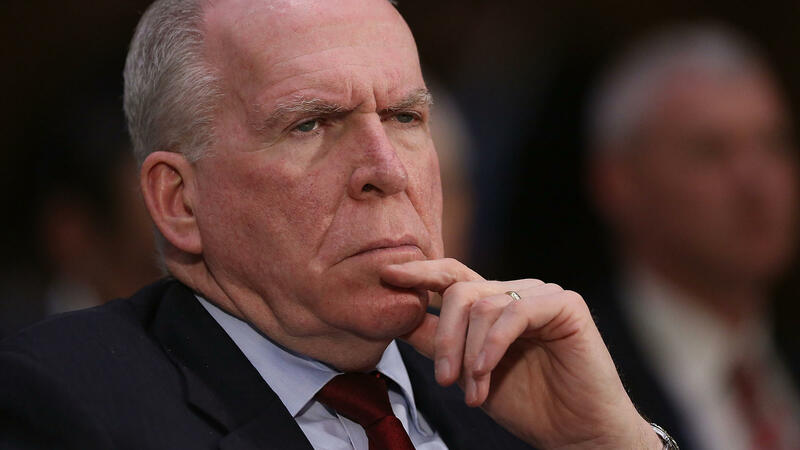 Brennan has repeatedly clashed with Trump on Twitter and on television, calling Trump's failure to denounce Russian interference in U.S. elections at a recent summit with Vladimir Putin "nothing short of treasonous." The White House announced Thursday that it was revoking the former CIA director's clearance because of what press secretary Sarah Sanders called "unfounded and outrageous allegations." Trump later said that he stripped Brennan's clearance because of his role in investigating Russia's interference in the 2016 presidential election. "I call it the rigged witch hunt," Trump told the Wall Street Journal. "And these people led it." The statement criticizing the White House's move is signed by top former officials who served under both Republican and Democratic administrations. Among them are Webster, who was appointed to the CIA post by President Ronald Reagan; Gen. David Petraeus, another former CIA director whom Trump had considered for a position in his own Cabinet; and Gen. Michael Hayden, a former director of the CIA and NSA. In an interview with NPR's All Things Considered, Hayden said the decision was purely political and that the White House had revoked Brennan's clearance "as a punitive measure because the president did not like what John was saying about him." Hayden warned the action will have a "chilling effect" on the entire intelligence community, that "if you disagree with the president, if you say things with which the president disagrees or he does not like, he is willing to take punitive action against you. And that has nothing to do with politics. That has everything to do with the freedom of American intelligence to be candid with the commander in chief." The White House says it is also continuing to review the clearances of Hayden and other officials, many of whom have criticized the president. Speaking to reporters as he left the White House on Friday morning, Trump called Ohr and his wife "a disgrace" and threatened to pull his clearance. "I suspect I'll be taking it away very quickly," he said. Trump said he is not trying to silence critics like Brennan and others. "There's no silence. If anything I'm giving him a bigger voice. Many people don't even know who he is, and now he has a bigger voice," Trump said. "And that's OK with me because I like taking on voices like that." Ohr, who heads an organized crime and drug-control task force, has drawn the ire of Trump and his allies for his meetings in 2016 with the British former MI6 officer who authored the infamous Russia dossier. Also, Ohr's wife worked for Fusion GPS, the political intelligence company that commissioned the dossier with funding from Democrats. Ohr had served at the same time as a senior leader of the Justice Department separate from his task force role, but he was taken out of that job amid charges that he might have concealed his meetings with Steele or his wife's ties to Fusion GPS. Deputy Attorney General Rod Rosenstein has said Ohr has no role in the ongoing Russia investigation that has been taken up by special counsel Robert Mueller.